Via: pbpulse.com: Burly, irrepressibly entertaining, a performer through and through, Jeff Lindsay batted around the idea of a life in the theater before he settled on the literary world. He struck gold in 2004 with the first of a series of novels about Dexter, the serial killer who works for the Miami Police Department, which was then turned into a successful Showtime series. Lindsay is a Florida boy from way back, and still lives here with his wife, Hilary Hemingway, the niece of Ernest.He’ll be appearing Saturday in west Delray Beach at the Hagen Ranch Road branch of the Palm Beach County Library for a fundraiser. You wrote books before, but didn’t break through until Dexter. Was it his voice that made the difference? Is it true that nobody wanted to get anywhere near the first Dexter novel? My wife and I had an agent, I sent in the manuscript, and he thought I was a weird Svengali who had somehow latched onto a Hemingway. He left the manuscript on his office floor for a year and never looked at it. It went from agent to agent to publisher to publisher for four years. Everybody rejected it, and I don’t think anybody read beyond the first four or five pages. The premise turned them off. In that first book, it’s the last line of the first chapter where you realize what’s going on. But nobody read that far. Finally I got a letter from Nick Ellison, who’s my agent now, which was so flattering I thought my mother wrote it. And the nickel dropped. The first agent, who’d never looked at the book, called Nick and asked if the book he’d just sold was the same book. Revenge is a dish best served as an all-you-can-eat buffet. Why’d you make the transition from theater to novels? I did stand-up; I ran a rock band; I acted; I read scripts. I did anything I could. It was Hilary who said, ‘It would be good if you just did one thing.’ So that’s when we started writing together. How’d you meet your wife? We met when we were kids; our families were good friends; I always say that it was an arranged marriage and we don’t even like each other. After we got married, and her mother got sick, we thought she had six months to live, so we said let’s go back to Florida and take care of her. And her mother got mad at the doctors, and six months turned into seven years. So we started writing books (Time Bender, Dreamchild) and they started selling, not spectacularly, but enough to keep body and soul together. 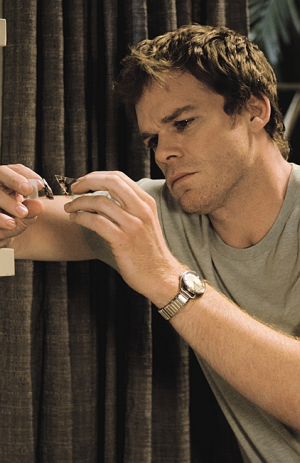 I find the TV show’s Dexter to be slightly different than your Dexter – a little more likable, perhaps, although that might just be the difference between a character in your head and a character inhabited by a living, breathing human being. Does that difference bother you? The first line Michael Hall spoke in character on camera, I thought he was perfect. Now, the longer the show runs, Michael has to stay interested, so they want to explore this, they want to explore that. God bless him. Please God, don’t let Michael Hall get bored too soon. But yes, the show is going farther away from the character in the books because he gets further away from being a sociopath. Sociopaths don’t have feelings; they can’t. It makes it tough for an actor. Did the TV show bump up the sales of the novels? Absolutely. No question. The first couple of years the show was running, I would be in the top 30 on Amazon. I have no complaints. It’s still a good show, recognizably what we started with, recognizably my brainchild. And as long as it’s done well, I don’t have any complaints. There’s always things. It’s TV and they have TV writers. At the beginning of season two, they’re finding bodies in 40 feet of water. Come with me off the coast of Miami and find 40 feet of water so convenient that you can dump a body there. Then show me a serial killer as smart as Dexter who would do that. That’s TV. If I wrote the Lithgow character in a book, it would be so corny and dumb I’d be drummed off the bestseller list. But if you give the same thing to Lithgow, it’s fantastic. That’s the difference in mediums – great actors can make things that are corny and improbable look like they make sense. Have you ever felt that you have to compete with the show? No. I watch the show, and it doesn’t hit me that it’s mine. I’m just watching a TV show I like. It’s like you’re watching American Idol, and your name comes up on the credits. It doesn’t quite register. When I’m writing Dexter, I’m inside his head. Any actor will tell you that the previous 8,000 King Lears don’t affect how he plays it because he’s the guy in Lear’s head. Do you want to do Dexter indefinitely, or have you some other writing projects you want to transition to? I have a million ideas. I’m working on a couple now, off and on. But I have to ride this while the horse is running. Someday it will be over, and that day will be when I start phoning it in. I’ve seen other writers do it, and it turns my stomach. For now, I’m going with it, but if it changes, I’m gone. I’ve got a whole hard drive of other stuff I want to do. I’m even working on a vanity project, a movie script starring me and a friend of mine, the guy who played Napoleon in Bill and Ted’s Excellent Adventure. He met his wife when they were just kids. They grew up and got married? Wait... that can't happen, right? Doesn't that defy the "Westermarck Effect"? Weird how people write books and create characters that have a bit in common with their own life stories. Westermarck effect really applies to close domestic living with one another. People who were best friends since childhood get married all the time; it's not as uncommon as you would think. And lol at the reference. Actually, a big part of that Westermarck research did involve childhood friends, as it was based on the Jewish Kibbutz system. Which, of course, should tell you all the problems with the research right there!!! You can't base research on a small, strict, religious community stuck in the middle of the most contested piece of real estate in the world - there is no doubt that many children would want to get the hell out of there. Quaker children on the other hand, seem to stay home and marry the neighbor girl fairly often. Just like Freud saying that "all children are disposed to incestuous thoughts" - which always sounded creepy, the truth probably lies somewhere in between. Human beings are complex creatures. I was just poking fun at the whole "Omg no no no, there can't be any unusual feelings or behavior in this strange story about a serial killer!"